Rough and polished turquoise stones. If you were born in December, you may find yourself a little confused on which stone to call your own. Turquoise has been the longest standing and most traditional birthstone for December, with zircon and tanzanite recently added. Many also consider blue topaz amongst the ranks of December birthstones. 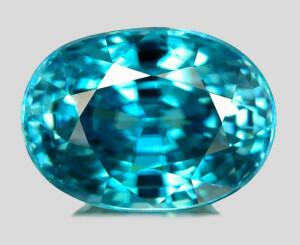 (Fun fact: Topaz is one of November’s traditional gemstones.) Whichever stone you prefer, December’s birthstones all bring a sense of calm, peace, and sincerity you gain from gazing at their gorgeous blue surfaces. And they are all amazing stones, so this month’s gemstone spotlight will encompass not one, not two, but four stones. What a good way to end the year. Turquoise has been on the list of December birthstones since before 1912, along with lapis lazuli (which is not heavily recognized as a birthstone today). It is, in fact, one of the oldest gemstones known to man. The name turquoise comes from the French phrase “Pierre tourques”, meaning “Turkish stone” although it was most likely originally mined in Egypt and Iran, not Turkey. Today, we use the word turquoise to describe anything of the blue-green color commonly associated with the gem, which is interesting because the color is actually named after the stone, and not vice versa. 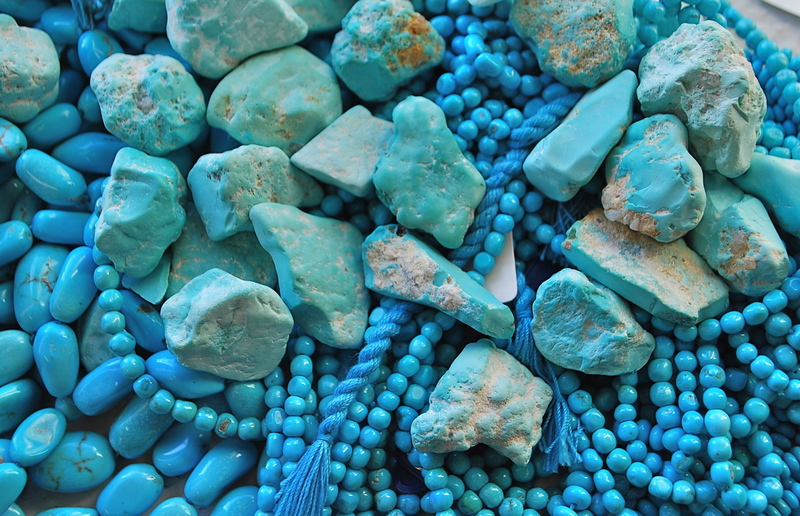 American turquoise is mined in Colorado, New Mexico, Nevada, and Arizona. A rare translucent variety is found only in Virginia. “Persian turquoise” refers to any turquoise which does not have black or brown veining in the stone. These are more commonly found outside of the U.S. in countries such as Tanzania, Afghanistan, Mexico, China, and Israel. The most valuable specimens are said to come from Iran. 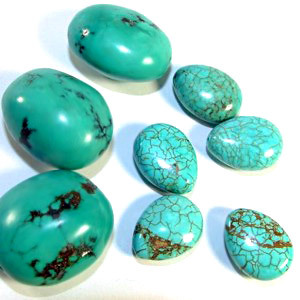 The value of turquoise stones based on color and patterning depends on region and personal preference. Most Americans prefer the spidery patterns, while clean stones are generally preferred east of here. Turquoise jewelry requires some care. It is relatively soft, and the color can be affected by harsh lighting, household chemicals, oil (including natural oils and perspiration from your body) and cosmetics. It is a good idea to remove your turquoise jewelry before washing your hands, showering, or applying perfume and makeup. 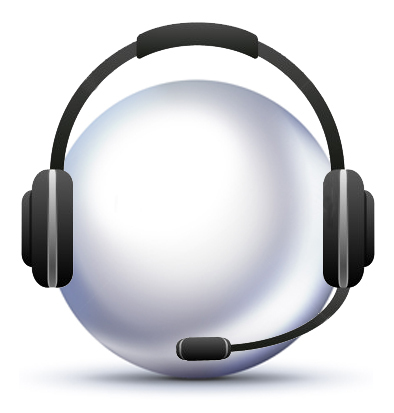 (Similar to how you would care for your pearls!) Most turquoise pieces are set in silver, although it is commonly found set in gold alongside diamonds in the Middle East. It is extremely popular in the southwest, and is associated with a lot of Native American style jewelry. It is regarded as symbol of good fortune, happiness, and success. Wearing turquoise, especially in a ring, is thought to keep away evil spirits. Turquoise jewelry in general is said to protect the wearer from harm and relax the mind. Apache indians believed that attaching turquoise to an arrow would increase the hunter’s accuracy. Native Americans have associated the color of the stone with the sky and the Earth, and many people today still think of it as being symbolic of nature. Shamans, healers, and medicine men have talked of the healing properties of turquoise stones, contributing it as a healing agent for heart ailments and blisters, amongst other afflictions. 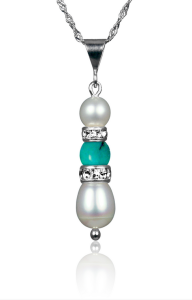 This lovely pendant features a gemstone bead in between two swarovski rondelles and freshwater pearls. It is available in both blue and green turquoise. 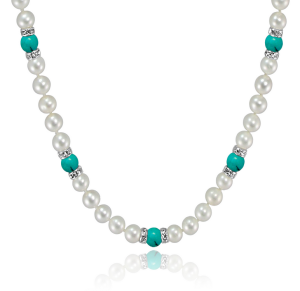 This pearl and gemstone necklace is perfect for any occasion. The name zircon is derived from the Arabic words for “gold colored,” although it is found in a wide variety of colors (with blue being the most popular, and also the color recognized as December’s birthstone). Stones that are medium dark and pure blue all the way through are the most valuable. It is a dense stone, so a small piece of zircon will have a higher weight than most other stones of similar size. Zircon is most heavily mined in Thailand, Cambodia, and southern Vietnam, though it is also found in Australia, Brazil, Sri Lanka, and etc. Colorless zircon is often confused with cubic zirconia and sometimes fraudulently sold as real diamonds. However, zircon is a natural gemstone, while cubic zirconia is laboratory grown. Of all the blue gemstones (and there are a lot!) zircon has the highest refractive index. This makes the stones look very brilliant, but they sometimes see a double refractive effect, which makes the stone look “fuzzy” around the facets. It is a fairly hard stone, but has a tendency to wear along the faceted edges and is sensitive to hard knocks, so should be treated as occasional wear jewelry, especially in rings. It should also be stored carefully. Zircon is said to aid in spiritual growth, bring wisdom to the wearer, and help find beauty and peace. It is said to relieve pain, protect travelers from injury and illness, and aid in sleep, including preventing nightmares. Many people in the Hindu culture consider trees to be sacred, and one legend tells of the Kalpa Tree, a sacred offering to the gods that was made entirely of gemstones. In this tree, all the mature leaves were made of zircon. It is said that when one wanted to find peace and seek out certain blessings, they would sit under the Kalpa Tree and meditate. 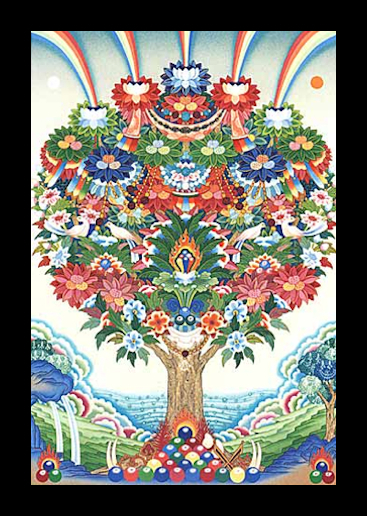 An illustration of the Kalpa Tree. The next December gemstone is Tanzanite, which was discovered in Tanzania in the late 60’s, making it a relatively new stone on the market. It is interesting because it is not found in any other parts of the world, while many other stones are mined all in several countries. In fact, the entire mineable area of tanzanite at present is only five square miles, surrounding the volcano Mount Kilimanjaro. 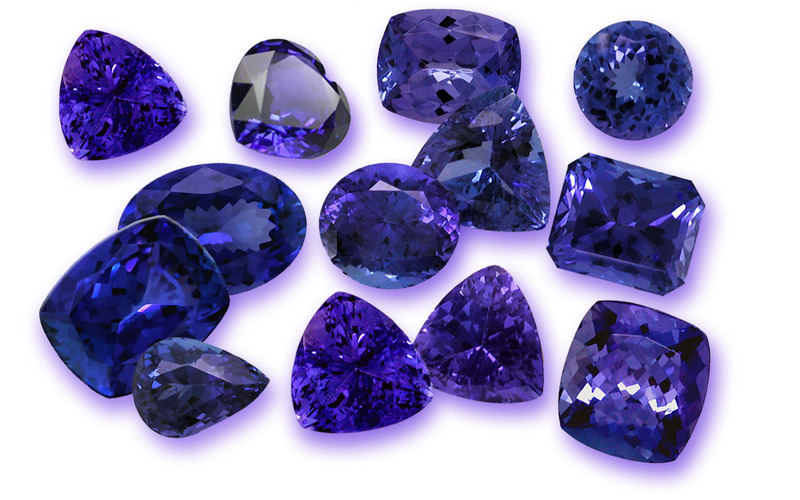 Tanzanite gemstones in several different cuts. Tanzanite comes in a variety of blue-violet blue shades, and can show brown or yellow coloration in certain lightings. It is often heated to remove the brown and yellow hues, leaving you with a blue or blue violet gem. There is little history on this gem, as it is still so new to the market. The final gem considered in the list of December birthstones is blue topaz. Topaz is discussed in our prior blog on November’s birthstones, as topaz is considered to be a birthstone for November. However, November most primarily recognizes the yellow shades of topaz, while December only considers the blue varieties. Topaz is a very popular stone due to its durability and its affordability. In fact, it is the second most popular colored gemstone on the market, outranked only by sapphire. 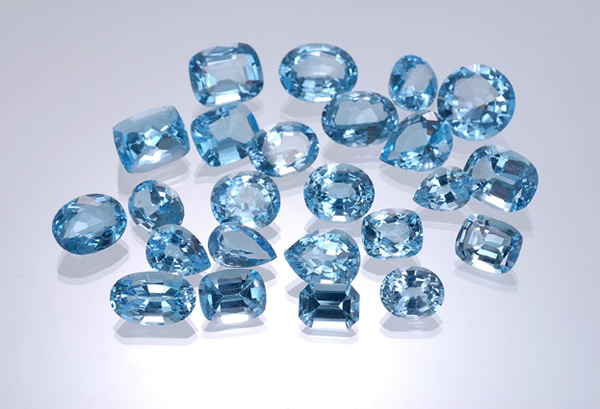 Blue topaz comes in a variety of shades. All deep, saturated blue stones are treated to enhance color. Most natural blue topaz is a pale blue. Pearls International’s jeweler has a fondness for natural blue topaz, and if you visit our Daytona Beach shores location you can see our chandelier made with natural blue topaz crystals, hand carved by our own Jim Stradley. 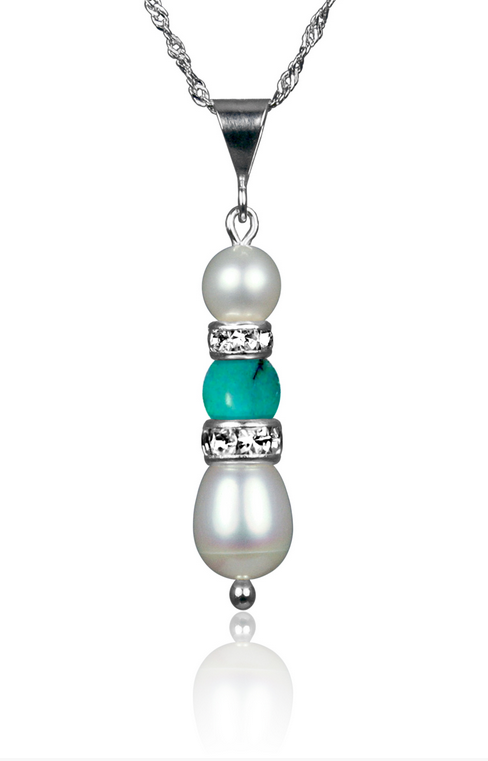 We also have pearl and topaz pendants and earrings available for sale. 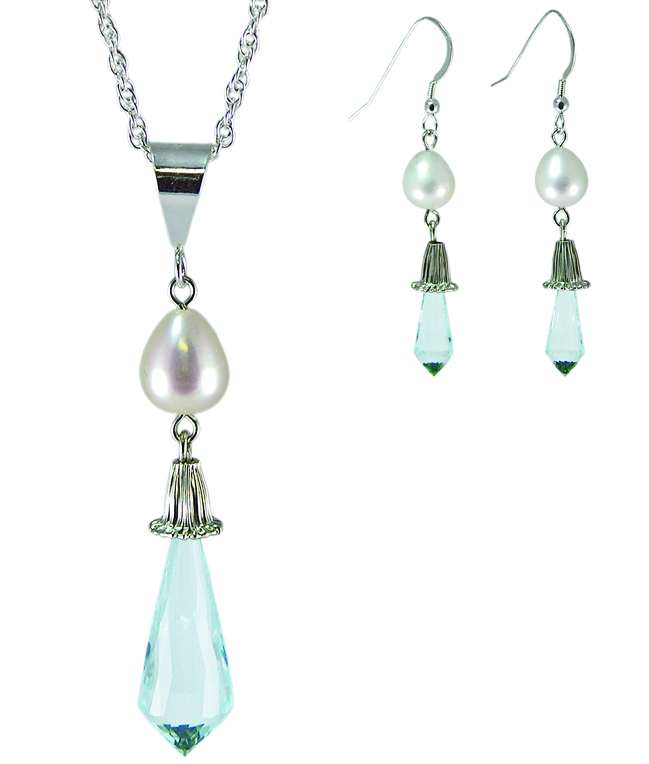 Pearls International’s natural blue topaz and pearl pendant and earring set. According to legend, wearing topaz can improve your eyesight. Topaz was also said to change color in the presence of food or drinks that had been poisoned. It is also thought to cure insomnia and asthma.